Yesterday was a full day. I spent the morning hauling five kids around in my pickup truck (extended cab, it was crowded but everyone had a seat) looking for kid necessities, you know, Yu-Gi-Oh cards, PS2 games, comic books, that kind of stuff. It was my youngest son and four of his friends. I managed to get them out and back by 11:30AM. At noon I left to do some banking and to head to the airport to meet my dad and step-mother and to meet her granddaughter. Her granddaughter was arriving from Guatemala and I wanted to meet her. Dad and Stella live in Chattanooga and had driven down here to Atlanta to pick up Luci. After doing my banking, I drove from my home here in Lawrenceville to Doraville and hopped aboard the MARTA train to the airport. Doraville is the terminal for the NE MARTA line and the airport is the terminal at the south, so I rode the entire line. I reached the airport at 2:13PM. Luci’s flight arrived at 2:05. I found dad and Stella and had a nice reunion with them while we waited on Luci to make it through customs and …. and waited some more. At 3:40 I realized I was going to have to leave or miss meeting my wife for other plans. I’ll drive up to Chattanooga next week and meet Luci. I am disappointed in not getting to meet her yesterday, though. I got back on the train and headed back to Doraville Station. I had forgotten to bring something to read so I just watched the scenery pass by and the people getting on and off the train until I found myself back at Doraville. As I was stepping off the train my cell phone rang. It was Gerri. I was suppose to meet her at her office at 5:00 to go to On The Bricks with her friend, Tina. It was 4:30 at that point and traffic back up I-85 was reported to be horrible because of road construction and accidents. Since we were going to take the train back down to Centennial Olympic Park, it was decided that I would meet them at Doraville Station, where I was right then. I waited. Gerri and Tina arrived around 5:20. We road the train to Five Points and transferred to the East-West rail to get off at Omni/Dome/GWCC Station. We met Tina’s cousin, his wife and kids in CNN center and had a meal before heading out to Centennial Olympic Park. 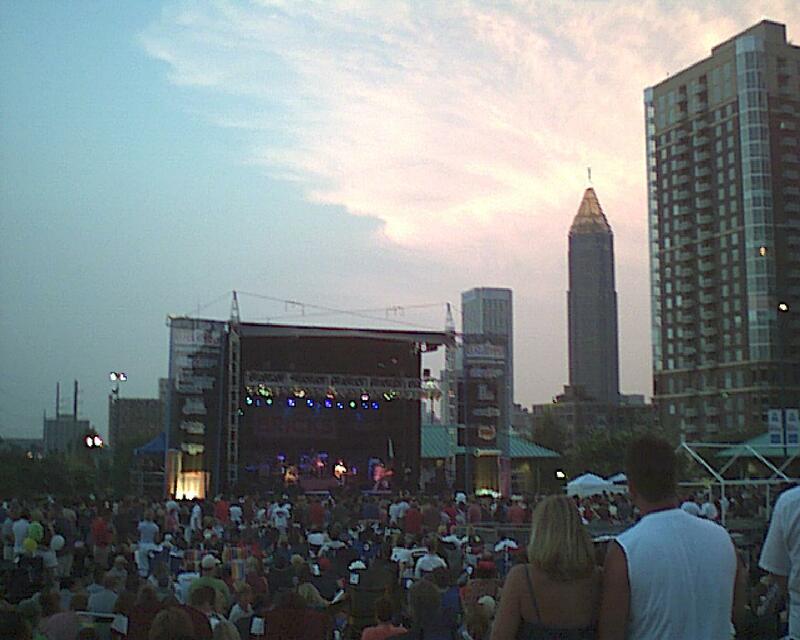 On The Bricks is a summer concert series in downtown Atlanta that costs $3.00 to get in. Last night we saw Hootie & The Blowfish, Tonic and Liz Phair, well worth the $3.00 admission price. The night couldn’t have been more perfect for a concert in the park. The city skyline at sunset was gorgeous. I had my cheap little cool-icam with me and tried to get a decent shot of it to share with you but it doesn’t do the sunset justice. We left the concert around 11:15 and hoofed it over to Peachtree Station for the ride back. The train was very crowded but the three of us managed to get seats. Gerri and I ended up getting back home a little before 1:00. I don’t think I’ll be wanting to ride a train again for a while. This entry was posted in Uncategorized on Saturday, 09-Aug-2003 by .